Broadway is becoming quite the epicentre when it comes to tucked-away-cafes-that-do-interesting-things. Lotus Story offers up tasty Vietnamese fare, and now there’s this Middle Eastern bolt hole, taking café lunching next level. Massive earthenware dishes of moujadra, rough-hewn tabouli, kafta and hummous have a bit of an Ottolenghi/Kitchen by Mike vibe, though the ordering system throws us for six. The specials are scrawled in felt pen on the glossy white tiles behind the coffee machine, and the glass case of food/open kitchen is down the other end of the room. It’s not a very intuitive set-up – the first urge is to look at the food, choose some eats, then pay. The way it’s arranged, you have to do the opposite, which is a bit muddled –especially when the person running the counter isn’t all that across the ordering situation. But we persevere and end up getting fed, which is all that really matters. Really, there’s no discernible difference between the vegetarian and meat plate, apart from two tender, flavourful little lamb mince sausages. 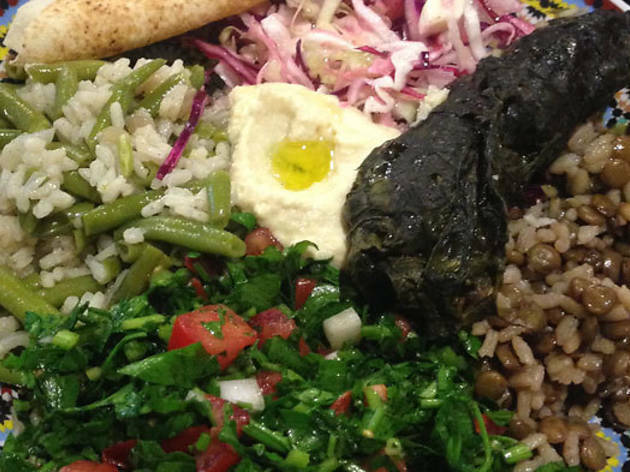 Both feature a blob of (slightly under-seasoned) hummous surrounded by a sort of rough coleslaw, a salad of rice and tender green bean nibs, another salad of rice and lentils topped with crisp-fried onions (that’d be your moujadra), tabouli and a piece of flatbread. 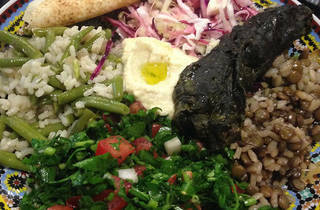 It’s a pretty carb-heavy midday meal – especially if you add a tender vine leaf filled with (more) rice to the mix. Then there’s the knafeh: that famous cheesy semolina pudding soaked in scented sugar syrup. Here, they’ve used what tastes like cheddar cheese, so there’s a strangely elastic (and extremely cheesy) layer under the pudding bit. We’d probably skip this, and head straight for the ginger Turkish delight – properly gingery and soft, covered in a thick cloud of icing sugar. This is probably more of a walk-don’t-run snacking situation, but still – it’s worth the walk.